Try our new delicious app! Can you find the matching two cards? Your kids can train their visual memory easily with sweet tarts, healthy fruits and delicious drinks. It sounds funny, but it works! 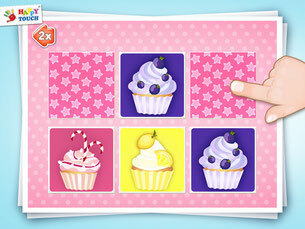 Keep your little ones educationally entertained with more than 30 different foods in this matching app. Our Tip: Kids can play it on their own, but you can also play with them. Take turns and you‘ll have more fun! Thanks for your personal marvelous posting! I actually enjoyed reading it, you can be a great author. I will be sure to bookmark your blog and will eventually come back sometime soon. I want to encourage you to continue your great writing, have a nice holiday weekend! Hi every one, here every one is sharing these kinds of know-how, so it's pleasant to read this weblog, and I used to go to see this web site everyday. It is actually a great and helpful piece of information. I'm glad that you shared this helpful information with us. Please stay us up to date like this. Thanks for sharing. If some one desires expert view regarding blogging and site-building then i suggest him/her to pay a quick visit this weblog, Keep up the good work.